Media Player, which was in turn based on XMMS. * Support of many audio and playlist formats. * The sound output can be redirected into a file. * Creation of playlists through a search plug-in. 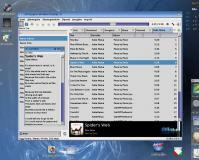 * Selectable GTK+ or WinAMP interface. * Useful plug-ins e.g. for the display of lyrics or an alarm clock. * Streaming through HTTP or FTP. "sat", "sci", "sng", "wlf", "xad", "xsm"
"psf", "minipsf", "psf2", "minipsf2", "spu", "spx"
"mat", "paf", "pvf", "sds", "sf", "w64", "xi", "fla"
(http://www.shoutcast.com) and import the list in Audacious. file, the image is displayed as a cover image while playing the sound file. Filenames with "album", "cover", "front" or "folder" are preferred. correctly, when the display is iconified. for their help while fixing the dead key and keyboard layout problems.